The SOG Specialty Knives & Tools TFSAT8-CP Flash II Tanto is designed for quick access while letting you have piece of mind knowing an additional safety lock is incorporated giving you extra security. Made of AUS-8 steel with an attractive hardcase black TiNi finish, the 3.5-inch straight edge, folding blade has a tanto shape with a very strong tip that's ideal for piercing, sharpens easily and makes quick work of any task. When you start to open the blade, SOG’s patented S.A.T. 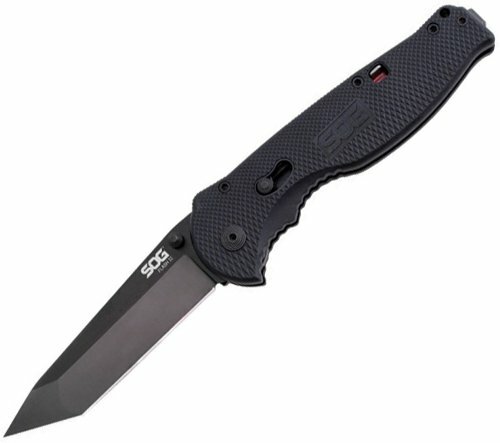 (SOG Assisted Technology) takes over and high-tension coil springs propel the blade the rest of the way open for fast, easy, one-handed access. A Piston lock utilizes a movable bar wedged between the blade tang and knife handle to securely lock the blade in place when in the open position. The ergonomically contoured and well balanced handle has a black finish and is made of a high strength, abrasion and impact resistant glass-reinforced nylon that will fit comfortably in your hand. A reversible pocket clip extends from the back of the handle, allowing the Flash to sit low in your pocket for the most discreet carry possible. This feature can also be used as a money clip. The TFSAT8-CP has a closed length of 4.5-inches, overall length of 8-inches, blade thickness of 0.13-inches and weighs 3.1-ounces. The SOG Specialty Knives & Tools TFSAT8-CP Flash II Tanto Knife with Straight Edge Assisted Folding 3.5-Inch Steel Blade comes with a limited lifetime warranty that protects against defects in manufacturing and materials. Each SOG product is created with the help of company founder and chief engineer, Spencer Frazer. Known for their uncompromising style and performance, these knives and tools showcase innovation, dependability and a unique, futuristic style that has garnered awards and recognition worldwide. SOG products have also won favor among law enforcement, military and industrial customers that rely on their tools to perform flawlessly in the toughest, most adverse conditions.